Many current and former college students have mixed feelings about dorm rooms. While dorm rooms may be sentimentally significant in the sense that they provide the first parentless homes for many young adults, the condition of many dorm rooms can leave much to be desired. Dorm rooms are often cramped, unpleasantly rustic and visually appealing, but they are not usually infested with termites for years on end. Unfortunately, this is not the case within the residence halls located on the Eleanor Roosevelt College (ERC) campus in San Diego. Numerous students that are currently inhabiting the dorms have been complaining about the presence of termites within their room. Not surprisingly, this is not the first time that termites have been found infesting the dorms. To make matters worse for administrative leaders at the college, the affected students are expressing their frustration with their termite roommates on social media sites such as Reddit and Facebook. The termite infestation within these dorms is nothing new, as students living within these dorms have been exposing the problem on social media sites for years now. The termites infesting the dorms are drywood termites, which, unlike subterranean termites, do not require contact with ground soil in order to survive; instead, drywood termites find all the wood they need for feeding within the isolated wooden objects that they infest. Drywood termites commonly infest furniture items, most of which contain internal wooden frames, and this is where the termites can be found within the dorms. In addition to infesting furniture in the dorms, students are hearing clicking sounds within the walls of the dorms’ halls, which pest control professionals say are classic signs of a termite infestation. Luckily, not all rooms within the dorms are infested, but even unaffected students have been forced to leave the dorms in order for fumigations to take place. One ERC student living within one of the dorms found 50 individual termites clustered on her window sill. 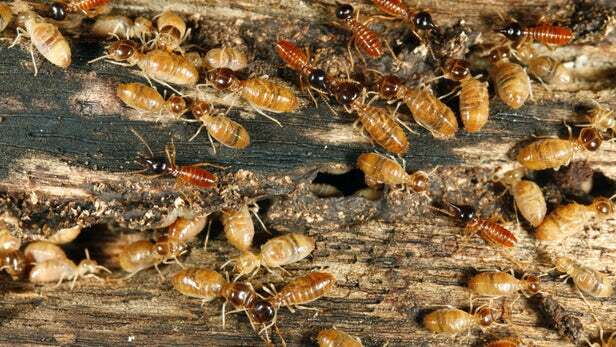 Maintenance workers merely vacuumed the insects from the window area, but of course, the termites returned. Not only is vacuuming termites ineffective at eradicating an infestation, but officials with the college have ignored additional complaints lodged by the student after the destructive insects returned. This student’s experience is shared by many former and current students that live and have lived within the buildings. Have you, or anyone you know, suffered insect infestations within a current or former dorm room?